L: 80" x W: 40" x H: 42"
Romilly Reclining Loveseat w/ Console The Romilly reclining loveseat with console lives up to its name—if we're talking minimizing space requirements and sparing that puffy look you might expect from a reclining piece. When it comes to contemporary style, this loveseat does not hold back. Subtle touches such as topstitching, cup holders, nailhead trim and a "weather worn" effect on the upholstery give this handsome piece a buttoned-up and fresh appeal. The Romilly reclining loveseat with console lives up to its name—if we're talking minimizing space requirements and sparing that puffy look you might expect from a reclining piece. When it comes to contemporary style, this loveseat does not hold back. Subtle touches such as topstitching, cup holders, nailhead trim and a "weather worn" effect on the upholstery give this handsome piece a buttoned-up and fresh appeal. L: 80" x W: 40" x H: 42" Width Fully Reclined*: 69"
We love our new Reclining Loveseat!!!!! 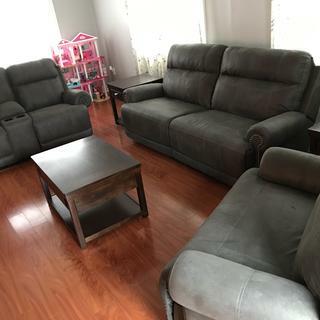 The Loveseat seam very sturdy and the material is easily cleanable. We love the color and the delivery and installation went very smooth. The recliner is easy to get into and get out of for old foggies like me. 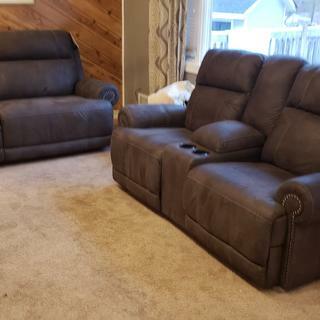 Very comfortable dual recliner I just purchased. Good price too. Not inflated like other stores. Will definitely return to Raymour for future purchase. I love everything about the Romilly set. My five kids all fit perfectly on the generously sized sofa, and my husband and I are very comfortable on our console loveseat. I highly recommend this furniture. It's wonderful! Each piece is so comfortable! I love it! I love the look, it fits so well in my basement, it's a perfect fit! I think this is the best purchase I have made from Raymour since I have been a card holder. 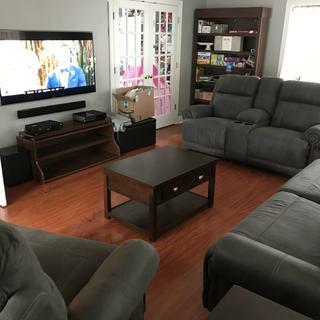 Very comfortable without compromising decor. Love it. Solid purchase. 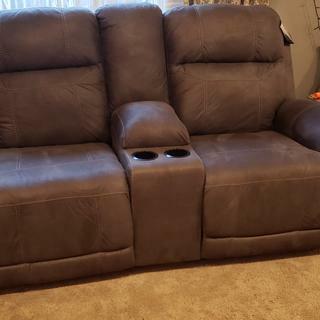 Firm loveseat with room to relax! Perfect for extra space to divide if needed. Eric & Chris delivered the Couch & Loveseat today. They were Early & Terrific!! Love the Color. Looks & Feels Great! I love this love seat ! Bought this and the sofa and the chair, excellent set! I've had this for a little over a year. LOVE IT. so comfy. Even dog friendly. do you have this loveseat on display in the no. brunswick store? BEST ANSWER: No, we currently do not have any on display in the North Brunswick Store. You might want to check the East Brunswick Store, there is currently one showing at that location. Can the loveseat be taken apart and moved into our space ? Down the stairs to a basement tv room ? BEST ANSWER: Yes. The seat backs are removable. BEST ANSWER: The Romilly collection does not rock/glide. No it only reclines . But i will say it is a very nice love seat. I would highly recommend. No it doesn't, it reclines only. Can you remove the console top so I can make it less longer? Does both chairs recline back and is this available at the 10461 store ? BEST ANSWER: Yes, both seats recline. If you go to the Raymour & Flanigan website, you are able search your zip code in "Find a Store". Once you click on the product you want, then select "See In Store" under the product name. There will be a list of stores, if the collection is available. Do you have this loveseat in the Paramus store? BEST ANSWER: This loveseat is an outlet piece. It is not at the Paramus store.